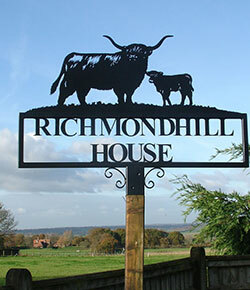 ‘The origins of Black Forge Art lie in an old farm building deep in the heart of rural Kent, where Rod Fender, design engineer, artist blacksmith, creator and displaced itinerant Northerner built a forge and began designing and manufacturing an impressive range of iron and steel artwork. His enthusiastic and original approach rapidly led to plenty of orders and an extensive, continually growing collection of ideas and designs. "My original aim was to combine top quality metalwork and blacksmithing with a large element of artistry, animation and detail previously unknown in this type of work. As a qualified engineer I managed to blend my previous career with artistic inclinations to develop a craft both unique and distinctive which I appropriately named 'Black Forge Art'. I always tried to ensure perfection and detail, whatever the commission or construction, and regardless of whether the design was my own or working from a photograph, sketch or idea supplied by a customer, I went to great lengths to bring as much life, movement, realism or humour into the finished piece as possible." 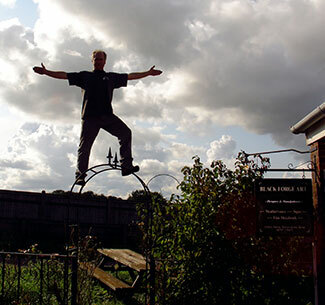 It is still this continuing 'perfection without compromise' approach to his work that twenty five years later has led to many thousands of satisfied customers now owning an original Black Forge Rod piece of metal artwork, throughout the UK and increasingly, worldwide. Nowadays, despite complaining about where the last twenty five years have gone, with impressively undiminished enthusiasm, Rod, with assistance from his team of like-minded blacksmiths, welders, wife and now we, now grown up, children, all still strongly adhere to those original principles. 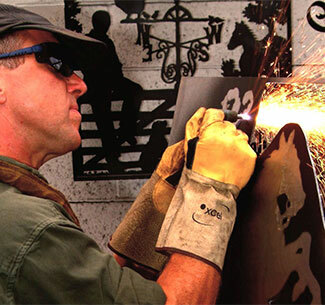 Commissions over the years now include many large and prestigious signs, village signs, public works of art, reproduced and renovated historic weathervanes. We also continue to hand make, top quality traditionally hot forged gates, railings, garden structures and a rather spectacular barbecue range. Whatever your order, the final result will be a substantial piece of impressive metalwork, both original and timeless, which has been manufactured to a quality designed to last a lifetime and guaranteed to give your property that traditional finishing touch, transforming it into a landmark seen and admired by all. Nowadays, while Rod continues to concentrate on the artwork, while still ongoingly hand cutting his designs and overseeing the completion of commissions, he enjoys having his family and team of workers/friends all pulling together. Which sadly, - we (his progeny) have heard a few times before - - - ! 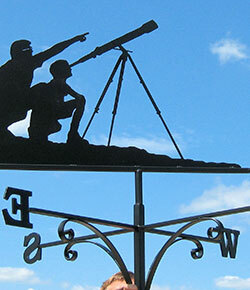 Thank you so much for the astronomer weathervane forged as a surprise present for my husband. He was surprised and speechless!! We are both absolutely delighted with the design and appreciate the workmanship. It went beyond my expectations...I just don’t know how you create such intricate parts within the design. The glasses are amazing. My husband was absolutely delighted and completely surprised. Thank you for your help with the design it is perfect. When it is in installed I will send a photograph. Sending my very best wishes. Just wanted to let you know how delighted my husband and family were with the sign. It was a complete surprise for all and I thank you for the service you gave us. 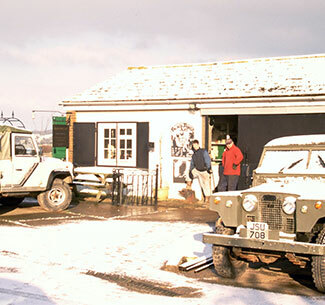 Pam and I will pop in and see you at the Royal Highland again and maybe bring you some Highland Beef. I am thoroughly impressed! I have shown your artwork to a few friends, who are also amazed. The words filigree and forge don't usually go in the same sentence, but this design is exceptional. 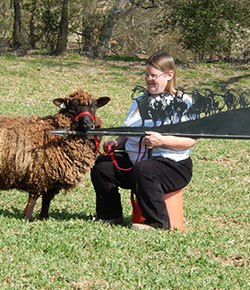 We all love the lead ewe, and the black girl is lovely (and very much like her photo). I am sorry to ask you to modify these last couple of details, but your picture is so realistic that it is worth getting the ears right. I am still elated about this weathervane! As excited as I am to see the new building going up, I am already looking up at the roof and imagining your weathervane there. I need the new mill building, but I really do want the weathervane.